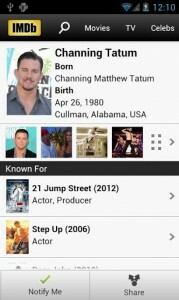 Choose notify mequot; on titles and names you’re interested in to be notified of trailers, photos, showtimes, and news. IMDb is available worldwide in English USUK, Spanish, German, French, Portuguese, Italian, Japanese, Korean and Chinese. We hope your IMDb experience on your Android phone and Android tablet continues to be entertaining. If you have questions about why we require certain permissions, please see our Android app FAQ page: http:imdb.comandroidfaq Galaxy Note users, if you are having trouble please go to the phone settings, then select language and Keyboard quot; The language setting will show English, but click to select it and you will see it is not English. Select English.